That’s all it takes for my children to get me to forget their messy rooms, their temper tantrums from this afternoon, or even the wet bathroom floor (which I am pretty sure was a joint venture). Such a sweet gesture can hardly go unnoticed! Hannah has been especially funny lately, coming up with other types of “kisses.” There is, of course, the “Eskimo kiss,” where she will rub noses with Ephraim. And of course, the slobbery, messy, “I-love-you-this-much kiss,” which usually requires some towels! But one night during bedtime, she asked me,” Mommy, why don’t you ever give me a caterpillar kiss?” When asked just exactly what a caterpillar kiss entails, she grabbed my arm and kissed it all the way up to my shoulder! Now that is thinking outside of the box! 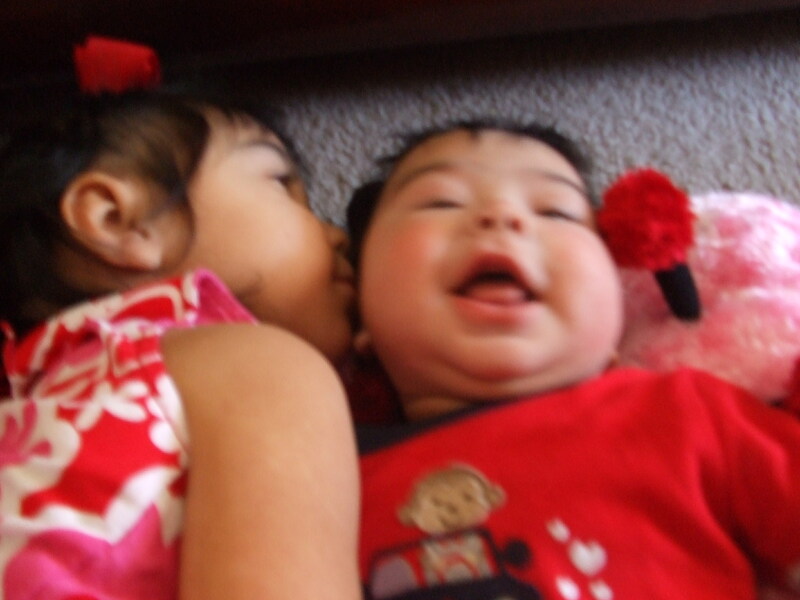 As I enjoy the kisses of my children, I can’t help but think about kisses in general. I am not a really touchy-feely sort of girl, so hugging and kissing can be a little awkward for me. I know that in some cultures, a kiss is used instead of a handshake. Kisses on the cheek are quite common in Europe, and the Maori in New Zealand as well as the Eskimos greet one another by rubbing noses. Just the thought of a stranger kissing me makes me want to hang a big quarantine sign around my neck! But I love to be kissed by my husband! And my kids are definitely a close second! A kiss can say so much, can’t it? “I love you,” “I miss you,” “I need you,” “thank you,” “goodbye” – the list goes on and on. But who would ever think to use a kiss as a betrayal? Judas Iscariot did. When I read the verse in Proverbs 27:6, “”Wounds from a friend can be trusted, but an enemy multiplies kisses,” I immediately think of Judas Iscariot. Imagine living your life with someone who knew you would betray them with a kiss (Matthew 26:47-56; Mark 14:43-52; Luke 22:47-53; John 18:1-27)! It wasn’t uncommon in those days or in that part of the world for people to greet each other with a kiss, but Jesus knew all along that one day a sign of friendliness and love would be the thing to betray Him! We are always so quick to judge Judas Iscariot, but I stop to wonder if we aren’t doing that same thing. Am I betraying Jesus with my kisses? Are my outward signs of love really glorifying God or myself? How often do we declare our love for Jesus, but then our lifestyle doesn’t reflect it? Who can truly say that each action we make is not in part to glorify ourselves? Judas betrayed Jesus with a kiss; but I think that each time we gossip or lie or treat another unkindly (even our children!) we are performing our own act of betrayal. Remember Peter’s actions that same night? He may not have betrayed Jesus with a kiss, but he made sure everyone around him knew he had no association with Christ! It wasn’t until the rooster had crowed that Peter realized that he had been ashamed of His Lord. Is that true when you go to the grocery store and don’t take a few minutes to be kind to the cashier? Are you ashamed to talk to your neighbor about Christ? Are you pulling yourself out of your comfort zone and ministering to a family in your church you don’t know? It just takes a moment – something we moms may feel like we never have any to spare! But you can show your love for Jesus by a kind word, a small gesture of friendship, a cup of coffee with the new mom in Sunday School. Are your kisses signs of love or an act of betrayal to Him who died for you?